CarrierBid will help your business design and implement a voice and data network at no cost to you! MPLS Data Networking – Private network over the public internet. Multi Protocol Label Switching, with Class of Service (CoS), allows for the prioritization of internet traffic; voice and video transmission can be given a higher priority than the data traffic. MPLS offers Quality of Service (QoS) which assures quality voice communication over the internet. MPLS is fully scalable, has no mileage billing component, offers throughput equal to its bandwidth and offers any to any connections, so overall it’s generally seen as an improvement over Frame Relay, Point to Point and ATM. CarrierBid can help your company design, implement and reprice your Multi Protocol Label Switching network. We can help your company conduct a Request For Proposal (RFP), evaluate the responses and project manage the installation of your new network. 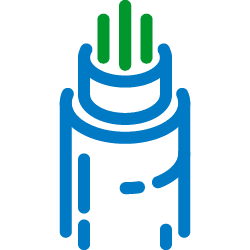 SONET optical technologies provide advanced network management and a standard optical interface at speeds from 155 Mbps (OC3) to 40 Gbps (OC768). SONET can be built in a self-healing ring architecture that uses two or more transmission paths between nodes. In the event one path fails, traffic can be rerouted. DWDM is a technique for increasing the bandwidth of optical network communications. DWDM allows dozens of different data signals to be transmitted simultaneously over a single fiber. To keep the signals distinct, DWDM manipulates wavelengths of light to keep each signal within its own narrow band. Speeds available on DWDM platforms generally range from OC3 to OC768 including Gigabit Ethernet up to 100 Gigabits. There are many varieties of Virtual Private Network (VPN) services available and depending upon your specific needs, CarrierBid will develop the best and most cost effective VPN solution for your business. The phone company’s lower-cost, high-speed internet service ranging in speeds from 256K to 40 Mbps. Available in speeds ranging from 64K, T1, Bonded T1’s, DS3, OC3-OC768. T1’s, ATM and Frame Relay are outdated services that have been replaced by Ethernet, SD-WAN, MPLS, Metro Ethernet, VPLS, Optical Wavelengh and VPN’s. Let a CarrierBid expert help you decide which technologies will make the most financial and technical sense based on YOUR specific situation, business drivers and long-term IT goals. If you would like help with any business voice and data networking service, contact CarrierBid telecom consulting or complete the web form on the bottom of this page.